7LeoVegas was one of the first casinos who mainly focused on online casino for mobile devices. The name LeoVegas is two words that the company have put together to describe what they are offering you. Leo stands for lion in Latin and Vegas is the town of our dreams according to the funders. Together the two words therefore describes that LeoVegas are going to give you top entertainment, a great gaming experience and the service should be the same as for royalties. 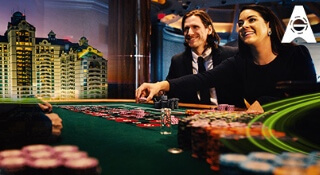 The casino is developed by Swedes and includes a loyalty program, with great service and offers. The VIP-program of course depends on how much you play, but if you are a member on this site you should remember to check your inbox, otherwise you might miss out on bonuses and offers. To see your VIP Level check the progress bar on the site. LeoVegas has a lot of games, slots, live casino and sports. On this site there is something for everyone, action, excitement and cool colours are a few things that describe the site. All new players from the UK will receive 20 extra spins with no deposit at LeoVegas. The extra spins are valid for 7 days from registration at the site. You can use the extra spins on the slot Book of Dead, and that way you can try out the game without spending your own money! The extra spins are credited to your account as a no deposit bonus, but LeoVegas also offer another bonus as you make your first deposit! The total bonus amount can be up to £400, and is spread out over your first four deposits. You will get a full 100% bonus on each of your four first deposits. The bonus is rewarded when you deposit £10 or more to your account, up to £100 per deposit! You will also be rewarded with additional extra spins as you make your deposits. You’ll recieve at least 10 more extra spins for each of your first four deposits. The extra spins expires after 7 days, and are valid for the slot Book of Dead. In total, that means 100 extra spins and up to £400 in bonus! The slot machines at LeoVegas are a true and huge mix of all kinds of thing. It is more than six hundred slots to choose from, and that is only the slots! Among the slot machines there are both old and new ones, more moderns ones and of course some of the more traditional ones. The games come from some of the most popular game developers in the industry like NetEnt, Playtech and so on. Since the casino is made especially for mobile devices the games also is made to be played on them. There are slots with jackpots, bonus games and a whole lot more. There is even a slot made especially for LeoVegas. The slot is called Vegas Party and is made of NetEnt, one of the best developers for mobile gaming. The game was one of the first in the world to have symbols who reached over several wheels in the slot. It begins with two wheels but can expand up to all five wheels. In that way two wheels are always connected and show the same symbols. Therefore all you need to win is that one more wheel next to it shows the same symbols. On the site you can also find slots like Starburst, Mega Fortune and Gonzo’s Quest. We have already mentioned that LeoVegas is one of the top casinos for mobile devices. The entire image for the company is based on it, and their marketing is all about being a casino for mobiles. The company themselves says that they are Europe’s most available and easy-to-use mobile casino. There is an app for smartphones and tablets but you can as easily play through a web browser. Both to download the app and to become a member is free. To play at this site is really simple. Once you have decided if you want to play through the app or browser, you sign up to the site, log in and then you are ready to start playing. You don’t have to think about more than what game you are going to try out first, perhaps the one where you got your extra spins when you signed up? It’s all up to you! LeoVegas vision is to deliver support that is top notch. Their support is available 24/7, which means exactly every minute every day. It is available in seven different languages, and also you can choose among three different English versions, British, Australian or Canadian depending on what country you live in. Except for English there is Swedish, Norwegian, Deutsch, Finnish, Slovak and Czech. You can choose between to chat live with a manager or email the support. We have tried the support in several languages and can confirm that they are open all the time and answer really fast. If you instead would like to talk to someone personally you could call them. Yes, they also have a few different phone numbers depending on what country you are calling from and in what language you want to speak in. If you thought that was it we have one more tip for you, the FAQ page. Here are all of the frequently asked questions, and maybe you can find the answer to your question right away. When it comes to the payment solutions you also have some options. There are six options which are; Neteller, Skrill, Visa, MasterCard, PaySafeCard and Trustly. The only thing you need to know is that LeoVegas want you to deposit and withdraw with the same kind of transfer. To deposit through your phone also works fast and easy, due to their specific focus on mobile devices. Bonus card combos at LeoVegas! Collect bonus cards at the LeoVegas blackjack tables before May 25th, and have the chance to win daily cash prizes and a share of the £10,000 grand prize pool! Join the brand new LeoVegas adventure, and travel back to ancient Egypt. 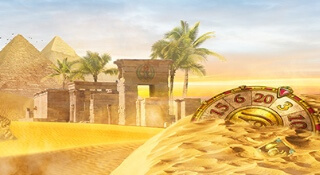 Collect points when you play Legacy of Egypt for your chance to win a share of £10,000! Collect points for the leaderboard when you play Live Roulette at LeoVegas Casino, and win a trip for two to Foxwoods Resort Casino right outside New York City! You might think that the huge amount of slot machines is what you can find on the site, but that’s not it. LeoVegas also offers a section of live casino. The different kinds of live games that they offer are; black jack, roulette, baccarat and poker to mention some of them. Most of the games also comes i different versions like roulette, golden roulette and so on. So there is a lot of options if you like live casino. Maybe you don’t know what it is? Let us explain briefly. It works that way that you play as usual, through your phone or web browser, but on your screen is a dealer through a webcam, who speaks to you and deals on a real table. So you, and others, get a place at the table and play against each other and the dealer handles the game. You can often choose which language you want the dealer to speak to. It is made so that you should get the feeling that you are there and actually sitting at the table for real. If you haven’t tried yet you definitely should! LeoVegas is not simply a casino site; they also are a sport and betting site. Yes it is true, there is even more in this site! With this review you hopefully already kind of know what you want to look into more, but first we need to talk about the sport section a bit more. LeoVegas Sport is the place for you who love everything about sports and betting. You don’t need to be a professional before you start making bets, even beginners will get help that will take their sports experience to the next level. On the sport pages you will find the latest odds and many tips that will make you an expert on betting. The sports experts on the site will come with some valuable tips that will make you a winner. You can bet on sports events that are live and on events that are coming. Since the site is optimized for mobile devices, it also makes the betting extremely simple. With internet and Wi-Fi connection almost everywhere it was natural for the company to also develop mobile betting. The menus are easy to navigate and you have much different kind of sports to choose from. Additional to this you can also follow live matches on the site and see upcoming events. In your profile you can change what format of the odds you’d like and make your experience more suited after what you prefer. There is a betting app that will make your experience better, than using a web browser. The adherence is much better and it takes shorter time to load the pages with. It is suitable for smartphones and tablets; our tip is to download the app! 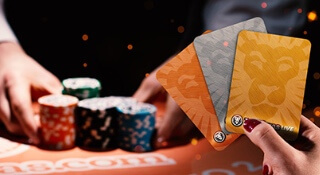 Malta is a very common place for companies in the game industry to have their base, and that is also the case for Leo Vegas Gaming Ltd who operates the casino. The company have two licenses that confirm that they fulfil all the requirements, follows the regulations and rules. The licenses are authorized by Malta Gaming Authority, MGA, and UK Gambling Commission Control. That means that all you winnings are tax free on this casino if you play from the UK. How great isn’t that?